Vitamins are a group of organic nutrients, which are essential to regulate the chemical processes that go on in the body. 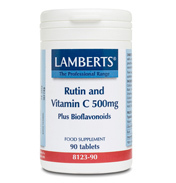 Generally speaking vitamins cannot be made in the body and must be obtained from foods, or supplements. 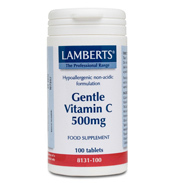 Our daily requirement for vitamin C is higher than for any other water-soluble vitamin. 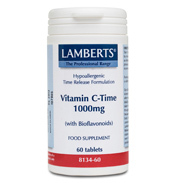 Ideally, vitamin C needs to be taken in small amounts throughout the day and night because it is rapidly lost from the body. 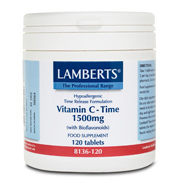 However, this is not always convenient which is why Lamberts have formulated Time Release Vitamin C tablets (the vitamin C is gradually released over 6 hours) making the product longer acting. Lamberts Time Release Vitamin C tablets also provide citrus bioflavonoids since studies show that vitamin C and bioflavonoids are most effective when taken together.